Aquatic creature features like to flaunt the dangers looming in the depths of the oceans, adding mystery and ominous possibilities to the endless, dark expanses under the water's surface. As one can tell by the film's title, The Shallows takes a different approach. Instead, it brings the presence of cinema's favorite seafaring man-eaters into the low levels of a Mexican inlet populated with gnarly rocks, coral formations, and, more importantly, a clear view of it all from the shore. Mixing the shallow-water setting with a genuinely emotional back-story for the film's heroine, director Jaume Collet-Serra swirls the recognizable traits of dorsal-fin suspense into a potent, conscientious tale of survival. 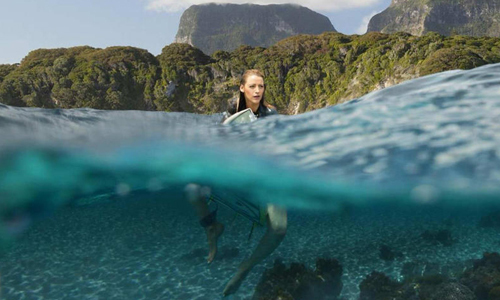 The harshness of the elements, the stalking of a predator, and a grieving surfer-girl's determination to endure and paddle her way to safety culminates into an overstated, yet inventive and exhilarating rejuvenation of the subgenre, propelled by Blake Lively's embodiment of a drained yet resolute foe for a territorial and hungry shark. On vacation from Texas, medical student Nancy (Blake Lively) has long thought about the moment when she'd discover the beauty of a "secret beach" in Mexico that her mother once enjoyed. In the midst of a life crisis and a mourning period, she's grabbed her surfboard and headed to find it, eventually landing on this secluded and breathtaking lagoon. While soaking in the sights and getting swept up in the experience, Nancy encounters a shark while out surfing by herself in the water, leaving her severely injured and stranded on a rock formation among the shallow waters. With the large beast circling around, she must figure out a way to get to the shore -- which, in a perfect world, is a short swim and a shorter paddle away -- or until she's rescued by the locals, counting down the minutes and nursing her wounds until then. Before stranding Nancy out on these rocks, The Shallows takes its time in setting up the young surfer's traits, her motivations and mental space upon arrival at this "secret beach" in Mexico (actually shot in Australia). Staggeringly beautiful, at-times intense photography of the isolated paradise from cinematographer Flavio Martinez Labiano captures her travels to the locations and her killer surfing abilities once she's suited up and paddling out. High, wide shots of the lagoon and vigorous plunges underneath the crisp blue water cleverly establish the geography of the area, while the music kicking off every time the perspective dips under the surface is a sublime touch. Underneath the purely engulfing photography, a conscientious and solemn portrait of Nancy's stalled medical career and reflection upon her mother comes to the surface, which also works as a diligent, relatively deep justification for the cavalier decisions that ultimately get her in trouble. By the time she's fighting for her life, it's easy to get -- and appreciate -- her mental state, why she's there and how she might be better equipped to handle the scenario. Because of this, The Shallows also doesn't rush into the crimson bloodshed and visceral tension of shark attacks, instead properly setting up the intensity to come within the secluded environment, along with the rationale behind why the predator has entered the low waters in the first place. Even after Nancy's initial brush with the shark -- a tense and unsettling display that twists the film's visual beauty into something beautifully darker -- the film keeps its composure while letting the realities sink in of her bout to survive on the rocks, concentrating on subtle mood-builders involving blood loss, tide levels, and her almost tauntingly close proximity to freedom. Blake Lively handles the panic-stricken attitude of such a trapped, injured individual exceptionally well, a frightened and incrementally weakening performance that's counterbalanced by her character's sharp thinking, limited tools, and kinship with a persnickety seagull. With Nancy trapped on a small craggy patch with both salvation and dorsal fins in her progressively blurring sight, the tension literally closes in and elevates around the surfer's limited surroundings, relishing every inch. Nancy's working against the clock, though, and that's also a countdown to the meaty thriller elements of The Shallows: the anticipated clashes with this large, intimidating predator of the sea. The line between natural shark encounters and intimidating entertainment gets stretched in the scenario, giving this hunter a degree of determination and rivalry more akin to the genetically-engineered mako sharks in Deep Blue Sea or the vendetta-driven great white in the later Jaws films, with its mammoth body circling the tiny rocks night and day in anticipation of the human prey it believes to be upon them. Matched with the vigorous but unnatural visual effects orchestrated by director Jaume Collet-Serra, the large shark's villainy demands a bit more forgiveness in the credibility department than the events that came before all this calculated hostility. While this makes for a hair-raising villain, a voracious elevated-reality version of one of the ocean's "monsters", it also undercuts the relatively realistic misfortune -- and honest character motivations -- that stranded Nancy out there in the first place. The tactics that Nancy attempts while escaping the situation lead to a rousing, albeit hard-to-believe culmination of twists and turns in The Shallows, cleverly recalling the film's early world-building in her victories and challenges. Working from a script that appeared on 2014's "Blacklist" of impressive unmade movies, director Jaume Collet-Serra strips contrivances down to the bare necessities, ensuring that most of the unavoidable ones he's included also propel the heroic qualities of the young surfer. Careful use of gore and brutal off-screen attacks quicken the pulse while pushing the boundaries of the film's PG-13 rating, all smartly contained around Nancy so that each elevation in her trauma and each bright idea mustered in her desperation result in progressively intense, gratifying thrills. The Shallows ebbs and flows when it comes to realism, but ultimately the film stays afloat by clutching onto both the unforgiving style and soulful substance of the surfer's troubles in paradise, while never losing sight on how the distinctive setting sets it apart from other shark-attack thrillers.